W9cm x H7cm (excluding hanging loop) Based on Lisa’s Yorkshire Terrier, this hand sewn bag charm was designed and made by me, he’s called Max! Completely hand sewn he’s now available in three different coloured Tour of Britain cycling jerseys, in honour of the 2015 Tour De Yorkshire. 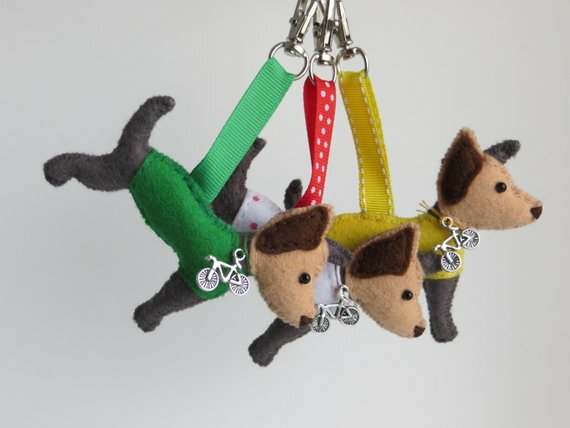 Choose from Yellow Jersey, Green Jersey or White & Red spotty King of the Mountains Jersey. 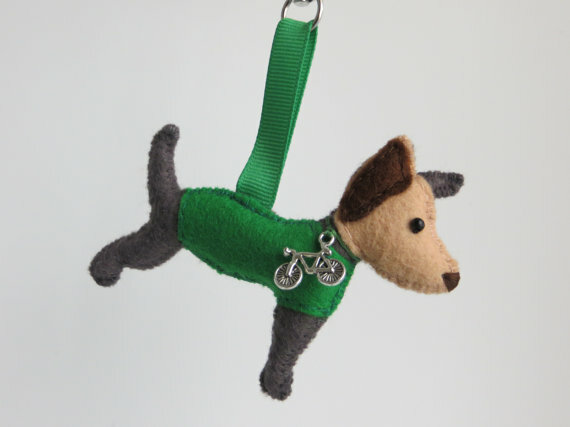 Filled with polyester stuffing, with a single black bead for his eye and a mini Tibetan silver bicycle charm finish the details. Hanging ribbon patterns will vary. Detailing to one side only. Also available as keyrings, keychains. Materials: Felt, polyester stuffing, bead, ribbon, silver metal bag clip, Tibetan silver charm.